The Obama administration is blocking any new oil and gas drilling in the waters off the West Coast and in the Arctic Ocean. No new drilling rights will be offered for sale over the next five years. Environmental groups and some California lawmakers applauded the announcement, but urged the administration to take the protections a step further by implementing a permanent moratorium. The blueprint for drilling from 2017 to 2022 can be rewritten by President-elect Donald Trump, in a process that could take months or years. A moratorium would be more challenging for a Trump administration to undo. “While today’s announcement is a helpful step forward to help keep fossil fuels in the ground for the next five years, President Obama should take the necessary next step, while he still has the power to do so, to permanently withdraw regions of the Pacific and Atlantic Oceans from future drilling, and to take the same permanent actions on the Arctic,” said California congressman Jared Huffman (D-San Rafael). It’s been decades since new oil rigs have been drilled off the California coast. Today, more than two dozen rigs are located offshore. 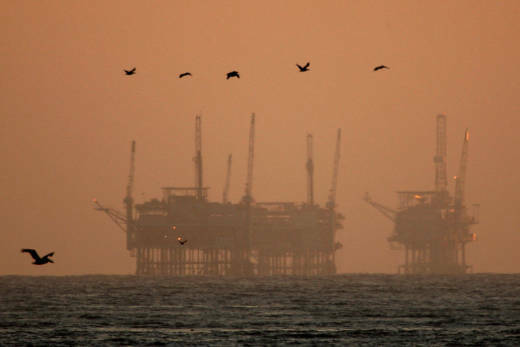 California has banned new oil drilling in state waters, which extend three-miles from shore. Oil drilling is also banned in national marine sanctuaries in federal waters. Industry representatives reacted bitterly, calling the decision political and not supported by the facts. Fellow Republican Sen. Dan Sullivan said the Obama administration was "once again capitulating to the demands of extreme environmental groups over Alaskans and their fellow Americans who want good-paying jobs, energy independence and a strong economy." Jacqueline Savitz, senior vice president of Oceana, an environmental group, hailed the announcement and praised Obama and Jewell for "protecting our coasts from dirty and dangerous offshore drilling." The announcement "demonstrates a commitment to prioritizing common sense, economics and science ahead of industry favoritism and politics as usual," Savitz said. KQED Science reporter Lauren Sommer contributed to this story.